Recently, the culinary team launched a Sunday brunch menu that is most certainly worth your close consideration. While the Chicago landscape is fairly littered with frittatas, decadent French toast concoctions and prodigious carving stations, the program here is a bit more subtle and refined. 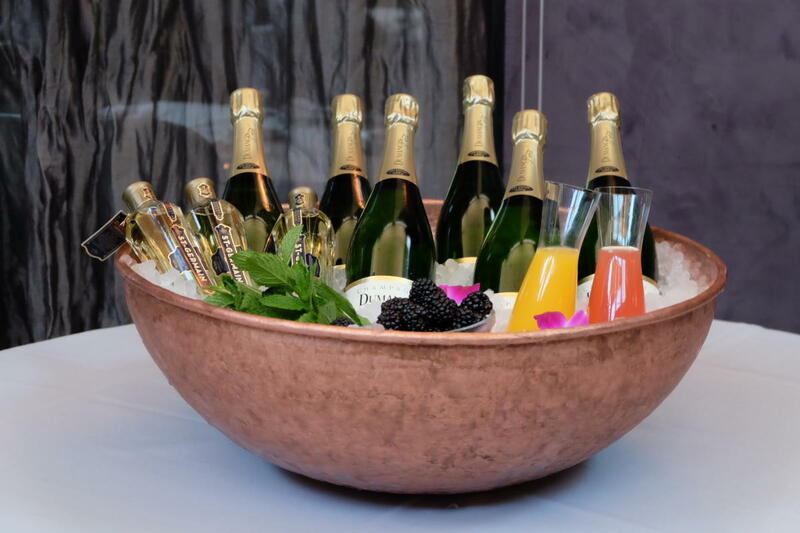 You may want to make a reservation before stopping by—the brunch happens from 10 a.m. to 2 p.m.
As a starter, you must simply go in with your companions on the Bottomless Bubbles. It’s a bit of elegance that involves champagne, orange juice, peach puree and elderflower liquor in a handsome presentation that you can use to make your own libations to suit perfectly your own temperament. It’s the perfect way to get things started. There are a number of elaborate stations within the buffet portion of the brunch, and your eager server will be around to offer samples of other items that may be ordered as accompaniments. While it would be impossible to cover all of the items in the stations, one includes Filet Mignon with bordelaise sauce (among others) and Smoked Salmon served with capers, lemon and dill yogurt, if the flavor strikes you. 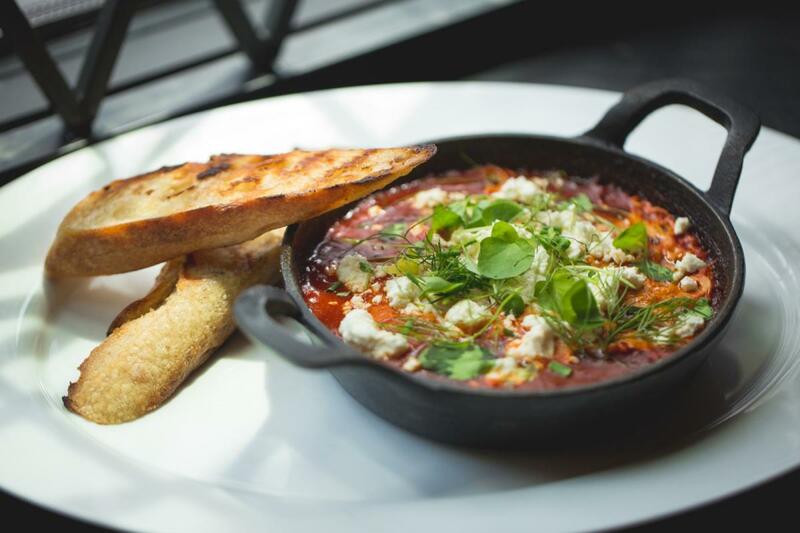 Along with choosing from among these monumental offerings, brunchers can step up to the specialty egg preparation station to order one of four assemblages, including the stunning Fire Baked Eggs in Purgatory, which is a bit like a shakshouka done in the Maple & Ash manner. There’s also a wonderful Grilled Bread Ham & Cheese Omelet and an Asparagus Simple Scramble with soft herbs. 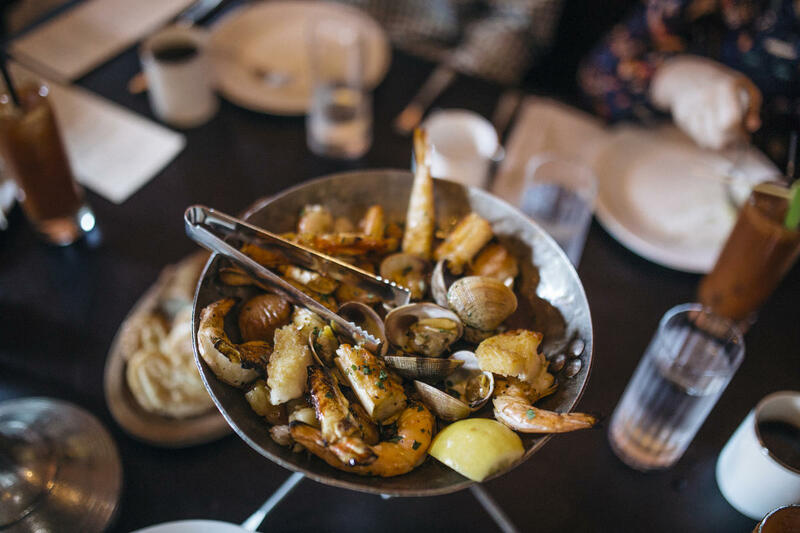 A bonus item to add on: the Fire Roasted Seafood Tower.